Class 1A Beechwood defeated Paris last week 47-3 while Frankfort beat Bellevue 24-14. The Tigers have defeated the Panthers the past 5 playoff games and should come out with a win again this weekend. Even though Gallatin County has a 10-2 record, they will have their work cut out for them to defeat the Breds. NewCath played a much tougher schedule this year and has prepared them for the playoffs. NewCath defeated Walton-Verona last week 36-0 while Gallatin County beat Carroll County 49-26. NewCath beat Gallatin County last year in the playoffs 49-13, and are looking to repeat last year's Class 2A Championship. 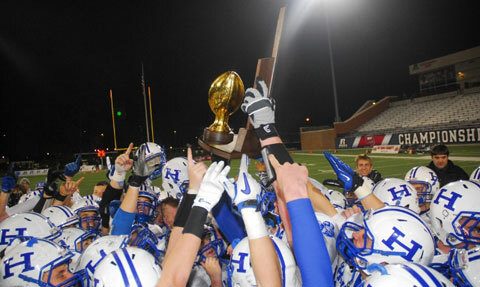 CovCath's last loss came to Highlands on September 28, 42-6. Since then, the Colonels have won 7 straight. They had an impressive win over Johnson Central last week 42-14. The Colonels return some key players since their loss to the Birds but it be enough to get them over the hump? Highlands defeated Ashland Blazer last week 56-6 and are looking for the 7th straight State Championship. They have defeated CovCath in 10 straight games dating back to 2007. Simon Kenton's undefeated season continues to Louisville Butler on Friday. The Pioneers defeated Dixie in our OMEGA Processing Game of the Week 31-19 to advance to this Class 6A Quarterfinal game. Butler defeated Campbell County last week 14-7. This should be a close game at first, but look for Simon Kenton to pull away and advance to the Semifinals. These 2 teams last played in 2009 where the Pioneers won 49-7. Last week’s Game of the Week featured Dixie vs. Simon Kenton. Sophomore RB Dillon Powell was our OMEGA Processing Player of the Game as Simon Kenton defeated Dixie 31-19 in the 2nd round of the Class 6A Playoffs. Powell led the Pioneer rushing attack with 111 yards on 15 carries and scored 1 TD.